As soon as my dragon finishes melting the ice caps, I shall rule the world! Sister Megan made my new blog header. Benjamin Franklin as a dad. Excellent. Benjamin Franklin showing off his Founding Father’s Day present. Not a president but close enough. The Augie Blog has a new header, thanks to Augie’s Auntie Megan! 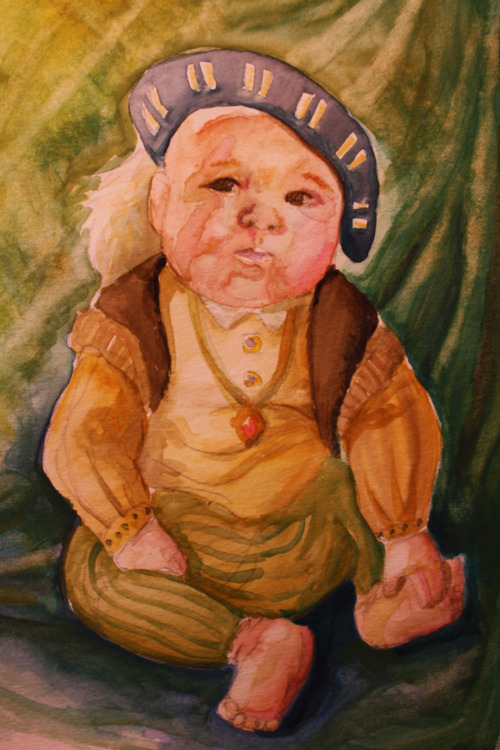 I asked for Augie as Henry VIII and she came up with this. Isn’t she good? If you would like your very own baby dressed like an English monarch, etc., ask her a question on her blog. A sketch of August from my little sister, Megan. My sister Megan sent me these pictures today. Adelaide gets this glazed-over look in her eyes sometimes…In this case, I’m not sure if she’s wary of the camera or if she’s really into the toast.